Tips for my first rye bread? Lately I've been thinking a lot about rye bread. I keep seeing these beautiful loaves, dark, white.. And in my mind I can even smell it! I wanted to make rye bread at home, so I went to amazon to look for flour and.... Which one should I get? white? dark? is dark the same as pumpernickel? organic? whole grain? is dark whole grain? can white be whole grain? I was a bit overwhelmed. So I tried to read a bit about rye bread and everyone keeps saying that the dough doesn't develop the same way as wheat, the bread takes way longer than wheat to rise etc. So here I am, asking for some insights from the rye bakers. If you were to bake with rye for the first time, which flour would you use? How about 100% rye with white rye flour? And...how much longer does it take to rise? (using commercial yeast, not sourdough). Chewy or like sandwich style? There are so many rye bread out there. You have to decide what kind of texture you want to experience. I suggest you take a look at Stan Ginsberg's book and website called "The Rye Baker".. You can choose a recipe based on the origin or on the texture. Some are made with natural yeast (like a starter) and some are made with commercial yeast. I'm going out on a limb here. This is my first post and I'm ready for the roasting. I’ve loved rye bread for decades. I had a grunt job at a Danish bakery in Racine, Wisconsin back in the late 60’s. At the time, the part of town known as “West Racine” had five Danish bakeries and 3 konditories. I was a kid back then and never wrote down the formulas but I remember that they used about a quarter cup of “Caraway Oil” in their best-selling Danish Rye. That’s what was written on the masking tape of the jug. The batch size was thirty loaves if my memory serves me. I loved that bread and took home a loaf every other day. My father and I actually came to testosterone blows over the heel of a loaf. With the help of Reinhart and this forum, I think I’ve come very very close. It should rise. Let it fall. I’ve found I’ve got a lot of leeway in the sponge. 2 tablespoons King Arthur Flour Rye Bread Improver. Make the sponge, cover at room temperature. Let it rise and hopefully fall. Guess eight hours at 70. Mix the main dough using all of the sponge and any water needed to just clean the bowl of a Kitchenaid with an “S” dough hook. Note: I’ve chewed up two drive gears in my Kitchenaid 6qt mixer. It’s a resistant dough. I’ve learned to let the mixer get it started and hand rage finish it off. Let double under cover in slick bowl – Usually 80 minutes room temp. Slash a bit to relieve the oven spring. I go once down the top and hope. Bake @ 350F with a water spritz at the beginning and again in a minute. I start checking at 35 minutes and am looking for 195F. It makes killer sandwiches and keeps about four days. Sorry for the mixed precision measurements. I’m a two loaf a week guy. 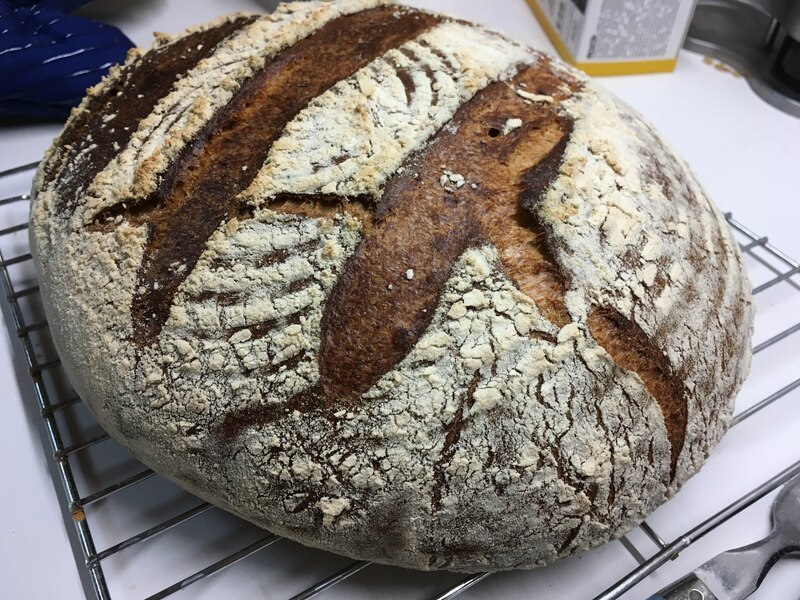 My two strongest recommendations for books with rye bread recipes are: "Bread" by Jeffrey Hamelman and "The Rye Baker" by Stan Ginsberg. Rye breads are my everyday breads and I love baking them. If I had to make a single suggestion, I would warn against over-kneading the dough. Unlike white flour, which benefits from kneeding to develop the gluten, rye flour has little to no gluten. If you overwork rye dough, it will suddenly turn sticky and pasty – and there’s nothing you can do to fix it. If I remember correctly from my baking school days, there’s a material called “pentosan“ which is released if the dough is overworked. It happens very quickly – everything seems fine and then all of a sudden the dough is an awful mess. If the percentage of rye flour is low, this isn’t much of a risk. But if the percentage is high, the risk is significant. Good luck! There are so many, many different kinds of rye breads, really. I make a killer Deli Rye (from Peter Reinhart's "Crust and Crumb") that has a 3-stage starter and takes about 5 days to make. Delicious though! I also have made 100% rye bread from home-milled coarse whole rye flour and/or Rogers Dark Rye flour. Never used 'white' rye flour. The 100% rye breads are not really dough as we know it, but rather a thick, sticky paste that is scraped into a pan without any kneading. And in my experience they ferment / proof very quickly (not sure where you got the idea that rye rises more slowly than wheat). I tend to over-ferment them because I'm used to watching wheat-based doughs and the 100% is so different. So, it depends on what kind of bread you like to make and/or eat, I suppose. Generally the more rye flour you use in a recipe, the less it behaves like a wheat flour dough. You can search on this site for many different rye breads. Mini Oven makes some nice ones. Stan Ginsberg has a great site on The Rye Baker, and I like the simple 100% rye breads in Emmanuel Hadjiandreou's "How to Make Sourdough" book as well. Thanks a lot for the insights, I decided to buy some flour and give it a try. I've being reading about rye dough etc. And i'll probably start with a mixture of wheat and rye and maybe later i'll try 100% rye, I want to make that "turtle" bread (looks like a pumpernickel boule and the surface is all cracked). After watching some videos I understood why i's "different" haha, it really looks like cake or banana bread batter. I can't wait for the smell of this bread! I remember my mom used to buy some when we were kids and I really enjoyed it!